« Angel Dust – SPOTTED in Foyles! 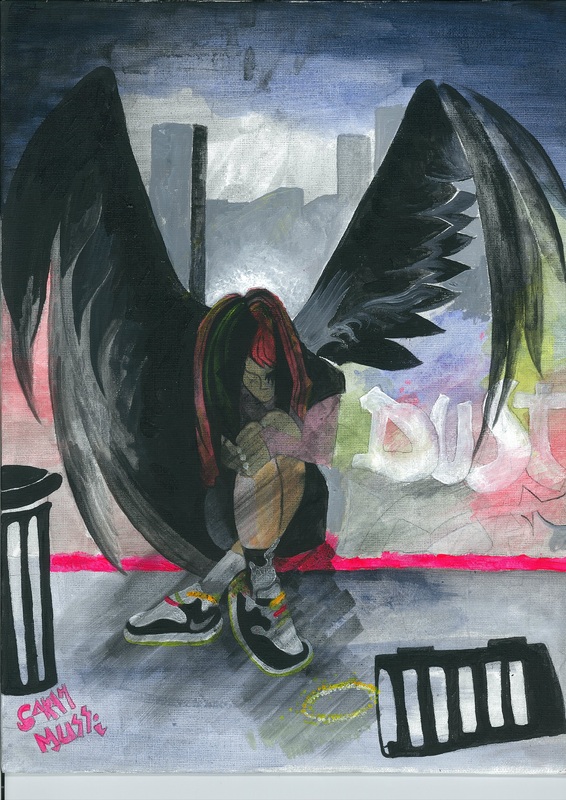 Enter our ANGEL DUST summer drawing competition for the chance to win this signed original painting by Sarah Mussi! To enter – draw or paint an angel or seraph and post it to Sarah’s Facebook page before 5pm on 31 August 2012. The winner will win Sarah Mussi’s painting and a signed copy of ANGEL DUST. Five runners-up will each receive a signed copy of the book. 1. To enter the competition you must be resident of the UK or the ROI. 2. Drawings/paintings can be made on any size paper and any materials can be used but the picture must be scanned or photographed and posted to Sarah Mussi’s Facebook page. 3. We will only accept digital copies of the drawing/painting and will not accept physical copies. 4. The competition is open to 11-18 year-olds. 5. The competition is not open to employees (or members of their immediate families) of Bonnier Publishing. 6. Only one entry per person. 7. Entries must be submitted by 5pm on 31 August 2012. Hot Key Books reserves the right to amend the competition end date at any time. 8. There will be one winner and five runners-up (from all eligible entries). 9. Our decision will be final, and no correspondence will be entered into. 10. The winner and runners-up will be informed on Facebook after 5pm on 31 August 2012. 11. The prize will not be transferable to another person. 12. No part of the prize is exchangeable for cash or any other prize. This entry was posted by admin on August 1, 2012 at 12:32 pm, and is filed under News. Follow any responses to this post through RSS 2.0.Both comments and pings are currently closed.